There’s a moment in this most interesting book that brought me up short, making me think afresh about the value we put on human life. Has it changed since the 19th century? The Yalda Crossing is the story of Captain James Beckett, his common law wife Harriette and her daughter Emily, and his adolescent son James. It is 1832. Beckett, depicted as a former military man of some integrity, has travelled beyond the Blue Mountains to settle along the pastures of the Morroombidgee River. These are the lands of the Wiradjuri people, and tentative first contact is made. When Tomawirra and Warrangaline bring a young woman with them to the homestead, Captain Beckett positions Young James inside, by a window, with a loaded rifle at the ready. Although not hostile to these people, the Captain is alert to the possibility that invisible Wiradjuri may be observing in much greater numbers from the curtain of bushland that surrounds the homestead. Using the resources at his disposal, Beckett has arranged for the protection of his family in case they are threatened. Shortly afterwards, Curtis, one of the convicts assigned to Beckett, requests a gun. Curtis and Webb have their hut on the fringes of the property. They are alarmed by the advent of the blacks and having made assumptions about their ‘nature’ they want to be able to defend themselves. Curtis makes what he thinks is a cunning appeal to Beckett, pointing out that the sound of gunfire would be an alarm to forewarn the family of danger. And Beckett, who has the man’s measure and recognises the ploy, gives the man a musket and just one shot, cynically promising that he will avenge their deaths should anything happen to them. This is a foreshadowing of the massacres that stain the history of our nation. But this casual promise that devalues the lives of the Wiradjuri and any right they might have had to a fair trial under British justice, also devalues the lives of the convicts. Confronted by a dilemma Beckett acts in self-interest. To give the men the same means of defence that he considers necessary for himself and his family, means providing these convicts with weapons that could also be used against him and his family. He chooses to leave the men vulnerable. And we know from reading Lyndall Ryan’s Tasmanian Aborigines, a History since 1803 that it was isolated individuals and pairs of convicts at the edges of settlements who were the white men most likely to die in frontier violence. Beckett would have known that too. Beddoe has constructed the dialogue in these scenes carefully so that we see just how expendable human life is, to Captain Beckett. He’s not a ‘sentimental man’, we’re told. But Young James, at 16 given the power of life and death over Warrangaline, is anxious. What if he misreads the situation and kills the old man by mistake? ‘Then he will have been a very unlucky old man’ says Beckett. And just as the Elder’s life is expendable so too the convicts’ lives mean nothing at all to Beckett … he doesn’t know the crime for which they’ve been transported to NSW, but he’s written them off as worthless anyway because they are sleazy and brutish. They are, as Henrietta said earlier in the book of the tiresome Irish, like the animals, not worthy of any consideration, merely useful to set up the property. In the event, it turns out that Curtis and Webb have more to fear from the Captain than they do from the Wiradjuri, and it takes a lot less than murder to provoke his retribution. To the impressionable Young James struggling to earn the respect of his father without compromising his own integrity, Captain Bennett’s actions are confronting in the extreme. Yet as we read about Young James’ struggle to find the ‘grace’ to guide him, all the while we know, from the way Beddoe has framed his story, that Young James himself has done terrible things too. The Yalda Crossing forces the reader to confront the moral dilemmas of the period. With the wisdom of hindsight it’s easy to see that dispossession was wrong and that the massacres that took place on the frontier were an evil that contemporary Australia needs to acknowledge. But the power of a book like this, written so cunningly in a reproduction of 19th century prose that it seems as if it were written contemporaneously with events, is that we can see the initial good will, the mistakes, the folly and the vulnerability of both sides. We can see that the Wiradjuri tolerated the interlopers until ignorance led to transgressions onto sacred sites. We can also see that while one man could dismiss his grave wrong-doing with ease, Young James would be haunted by it all his life. After a chance encounter with Lancaster who had witnessed the unfolding disaster, Young James – no longer young – sits in his attic at night, rereading his adolescent journal and retrieving memories long suppressed. 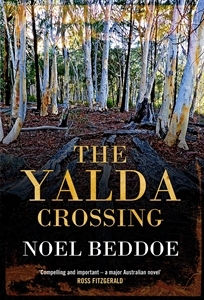 And while clearly Beddoe’s sympathy lies with the true story of the Wiradjuri on which his story is based, he has woven the sorry tale in all its complexity, showing that men, both black and white, can do evil things when circumstances conspire to trap them into it. You can see an interview with Noel Beddoe on the 7:30 Report here. Source: Review copy courtesy of UQP. Fishpond: At the time of writing this post, Fishpond has this book with the title Song of the Jirri-Jirri but it is the same book with the same ISBN. It appears that Song of the Jirri-Jirri was its original title (because the Jirri-Jirri bird has a strong spiritual meaning in the story) but UQP has changed the title between sending advance information to the bookseller and actually publishing the book. You can also buy the book direct from UQP. Sounds like a great book. Thanks for telling us about it. Hi Lisa do you think this book deserves to be nominated for any awards? It sounds like one to look out for. I’d like it to be nominated for something. But, alas, judges and I aren’t always on the same page LOL. Hi Celestine, I’m curious: are African writers writing historical fiction about first contact in Africa?